It’s pretty hard to believe that a little over 6 years ago, the iPhone didn’t exist, let alone the app eco-system. According to a Time magazine article, the average person unlocks their their phone 110 times a day. That translates to unlocking our phones about 10 times an hour. What exactly are we checking? My guess is that we spend the majority of our time on email, Facebook, Twitter, Instagram, and entertainment apps. I was going to research this breakdown, but instead, I wanted to just share the apps that I can honestly say I’ve consistently used on my iPhone over the last year. So in no particular order, here are the apps I’ve used during 2013 (these are apps that don’t come pre-installed on the iPhone). I’m sure I’ve installed and deleted many that I can’t remember. But these are the apps that are still installed on my iPhone at the end of the year. 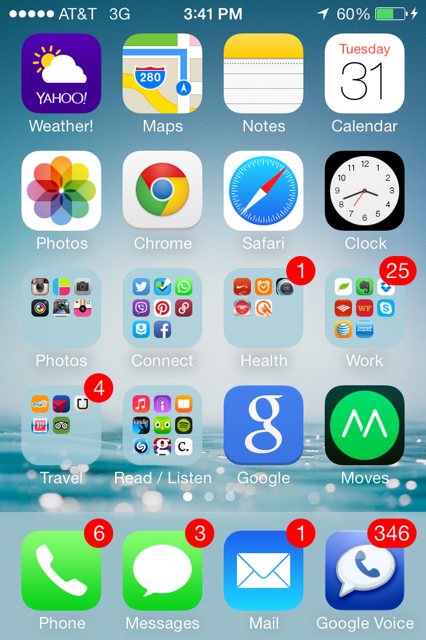 I like to organize all my apps into folders, here’s a screenshot of my homescreen just for interest. I continued to be amazed at how in such a short amount of time, the iPhone has become such an integral part of our every day life and I don’t know what I would do without it. Yet at the same time, I have concern for what it’s doing to us socially. I’m always shocked at how many people use mobile devices as a way to tune out reality. I know everyone says this, but it really is shocking to be out at a bar, restaurant, or even someone’s home and see everyone around the table with their phones and failing to pay attention to everyone in their physical presence. I can’t imagine what this list will look like at the end of 2014. But, I do plan on exploring apps related to health, finance, productivity, and travel. I’m more curious about apps that provide great utility rather than apps just to pass the time (though I admit, throughout the year I have been addicted to both Dots and Kami). What apps are on your phone? 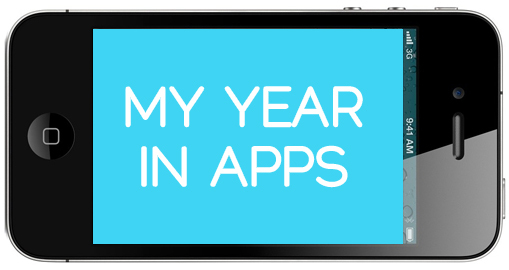 What apps did you use on a consistent basis throughout 2013? I’d love to hear from you in the comments!